A Start to the End of the Gritstone Season? As many of us are aware it’s been a strange collection of weather conditions over the last couple of months and it’s basically been a choice of venues based on which indoor wall is quietest. Local boy Ethan Walker commented on this recently on his blog and pointed out that whilst we can all moan about the wetness, at least we’re indoors getting a little bit stronger…. Finally last week I felt like things took a turn for the better and I immediately reminded myself of the routes that I’d abandoned 2 months ago due to damp. 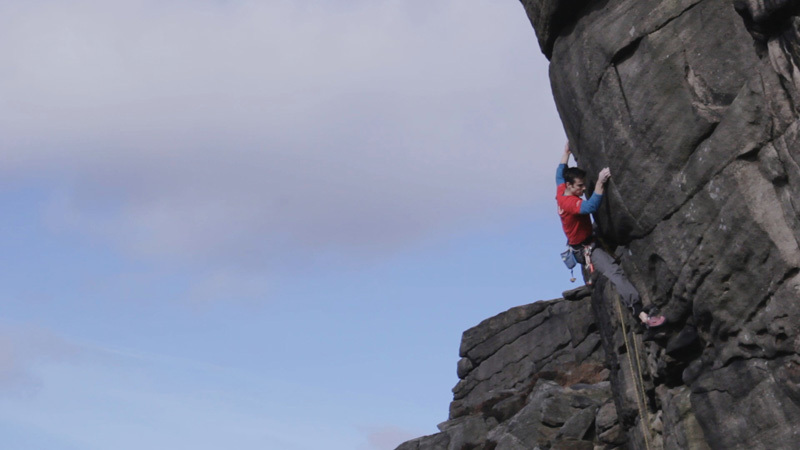 First was a boulder-route link up at Higgar and the other being Captain Invincible at Burbage. The Higgar Tor line has been in the back of my mind for absolutely ages since I saw a thread on UKB about the direct start being done by Ed Brown (Block and Tackle Direct 7B+) and someone saying in the forum that it’d be good to climb that straight into Block and Tackle E6 6c. When a windy day arrived in amongst the showers last week I packed everything up and got a belay off a mate. When we arrived at the crag it was blowing an absolute hooley which was good for dry rock but not exactly that easy to warm up. After working out an easier method of doing the direct boulder problem (just jump!) at maybe Font 6C it was promising that it’d all link up. Half an hour later and having flailed around even more on the boulder problem I scraped my way up the whole thing for a really rewarding first proper route of the gritstone season. Guy Van Greuning the Sheffywood Film Magnate has made a short video about the ascent, so I’ll post that up very soon. Having got that route under my belt I then got really hopeful that my main winter’s project of Captain Invincible might be possible. I’d got really frustrated since Christmas with the holds always being damp or wet but over 5 days of windy conditions had to be good. Surely, surely?! When I first started working this route before Christmas, it was a bit of a wake up call. I couldn’t even do some of the moves after a few sessions of working, which is never promising. After a while I also tried going on it with a few people who I’d consider being really strong to see if they could show me the way and that I’d just mis-read it all. Nope. I was just not pulling hard enough! Maybe that was what I needed though, as it meant I put my mind into a new gear and decided to get a bit more gnarly. That means for me, going down The Climbing Works, doing some campussing and back-3 finger boarding. I know that’s probably pretty normal for many of the Sheffield boys, but that’s big changes for me! No more cracks. No more hiding behind endurance. A Christmas of training, a New Year of training and finally Jan & Feb training, finally got me to the base of Captain Invincible last week ready for a lead attempt. Andy Reeve (more E9 belay ticks than Pete’s mum probably?) had come out for moral support after nailing his heel on another one of his weekly grit forays and seemed psyched that I’d chosen to go for the lead just a few hours before needing to go and catch a plane to Spain. Nothing like a bit of pressure. In the end the lead went brilliant and unusually for me, I felt pretty solid on it. There was a bit of waver in the middle where it gets a little interesting if you were to fall there, but I could hear Reeve’s voice below pushing me on. Once you get to the last break (see photo) then you’re into the crux of Offspring and I made sure I shook out fully knowing at least one of the previous ascentionist had fallen here. What an absolute heartbreaker. I’d already pulled on a “back 3” like it wanted to break my fingers and twisted a pinky mono until I winced, so I had no desire to do that again. I still hurts a bit thinking about it now. Overall I thought the route was absolutely amazing, mainly because it’s so unlike many of our hardest grit routes in the UK. It’s actually physically hard, you need to be sport fit, there’s toe hooks, heel hooks, mono’s and slopers. Everything you’d want to take to a desert island I suppose. It’d need to be a cold desert island mind…. 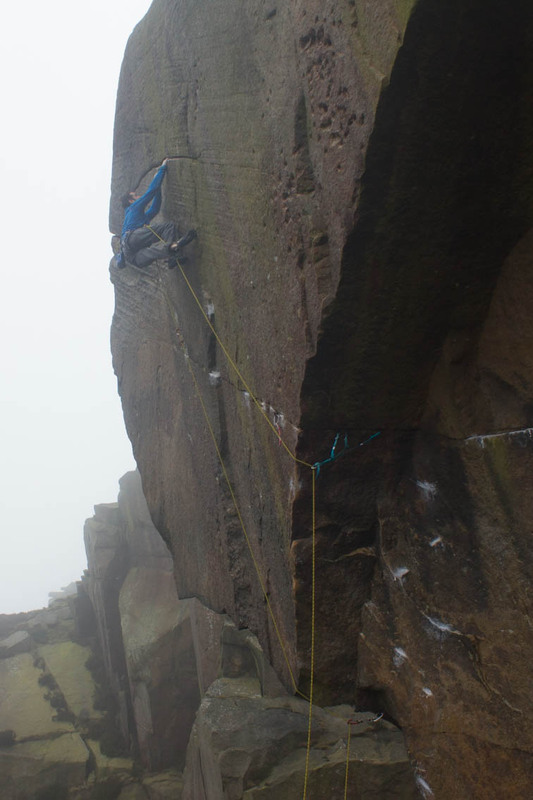 This entry was posted in Uncategorized and tagged burbage, captain invincible, Gritstone by tomrandallclimbing. Bookmark the permalink.